Camping is enjoyable enough on its own but I have found that I enjoy birding more when I'm on a camping trip. 1) You become more in tune with nature while camping: One of the reasons I enjoy camping is that you eliminate a lot of the every day distractions you become used to. this allows you to become more sensitive to the sights and sounds of nature that surrounds you. Hundreds of years ago Native Americans were completely in tune with nature. It was key to their survival. They didn't have modern conveniences to rely on. I believe spending some time camping helps give you a sense of that same connection with nature. When you're camping you need to worry about building a fire, eating, relaxing, and sleeping. You can go birding an not have to worry about things like going to work or cutting the grass. 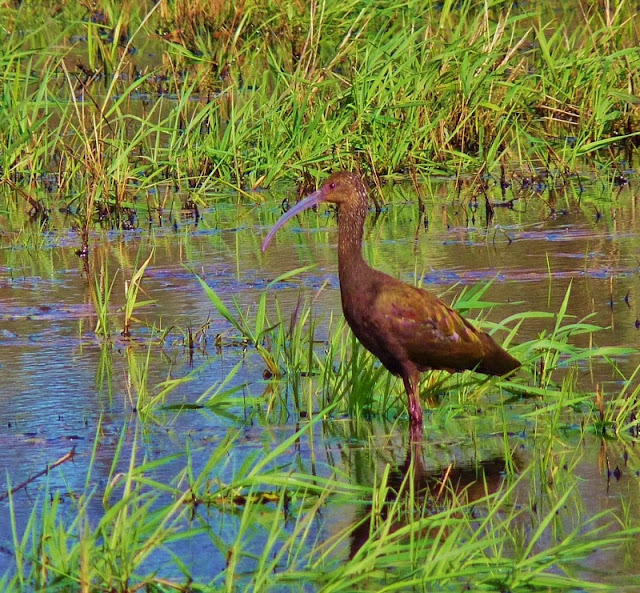 It allows you to go birding for as long as you want at whatever pace you want. 3) You might as well go birding where you're at since you're there already: Have you ever started birding at a location and became impatient? Maybe the place you chose to go birding is a little slow and you wonder if you might be better off trying a different spot. Chances are that you didn't give the place you're at enough of a chance.When you're camping you can take the time to explore the place you're at to the fullest. 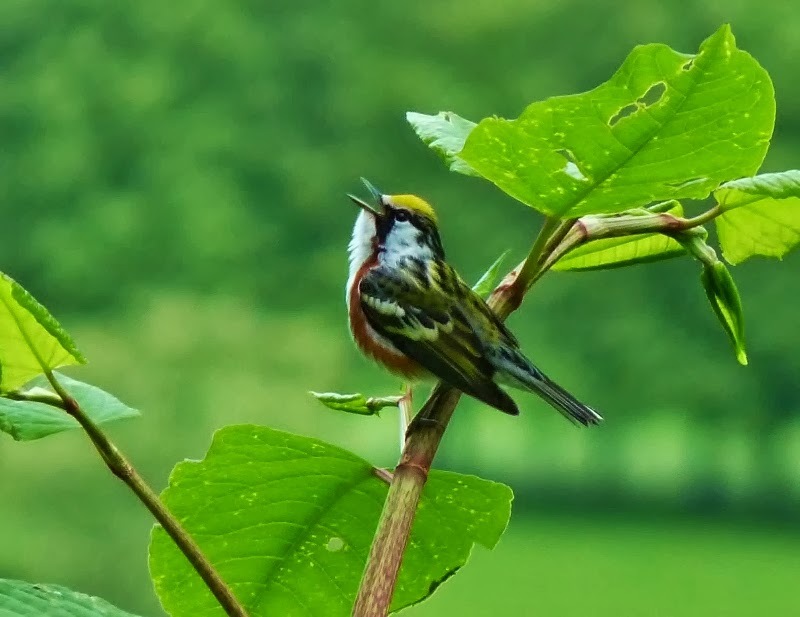 4) Birding becomes more appealing because you don't have a lot of options: When you're camping there are less things around to keep you entertained-no computers, cell phones etc... That makes birding a more appealing option. 5) The extra time that comes with camping makes it easier to set up a scope or take photographs: A lot of time I don't bother using a scope while birding because I'm in a rush and don't feel like lugging it around. The perfect time to use a scope for more detailed nature study is while your camping. It's also easier to have the time and patience it takes to capture bird photos. I'm sure that there are many more reasons I could come up with but I'm busy packing for a camping trip! I had a chance to catch the last free riverfront recapture event for 2013 at Mortensen plaza on Saturday in Hartford. There was plenty of great food and music. Unfortunately, I arrived about 10 minutes too late to catch the birds of prey exhibit.This is a Red-shouldered Hawk that I saw there last year. 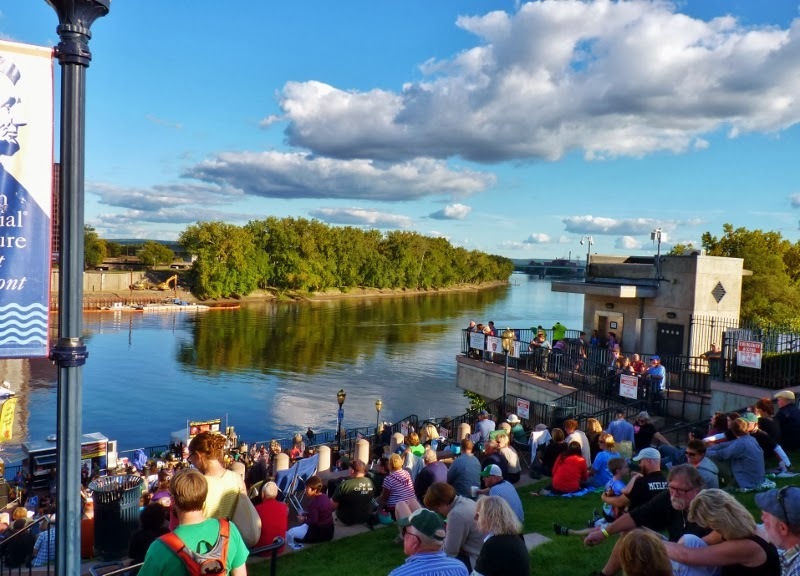 Nevertheless, it was a great way to celebrate the transition from Summer to the Fall season. They started setting up for the Portland fair this weekend. 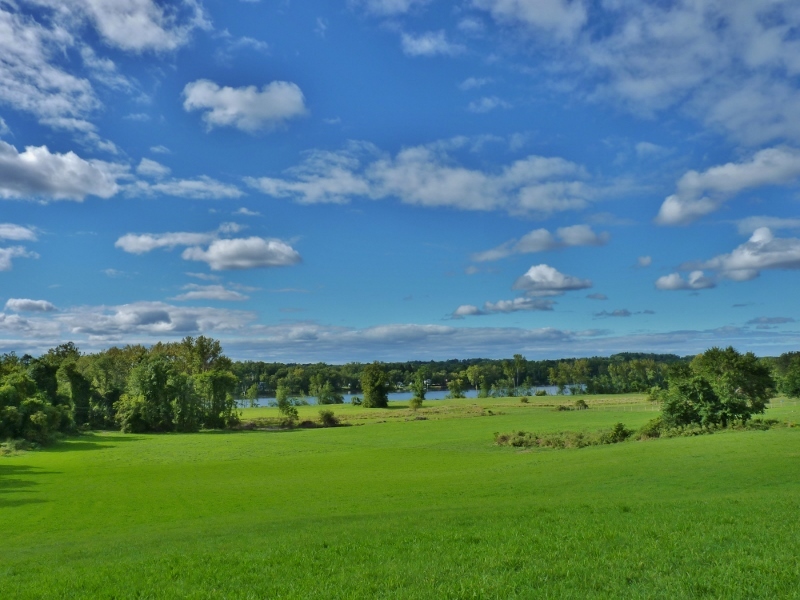 The fairgrounds are located at the south end of Wangunk Meadows which is one of my regular favorite birding spots. I though that all the activity of large trucks coming and going would have spooked most of the birds away near the fairground area but as I peeked over an area of overgrown grass I found a Green Heron stalking prey. 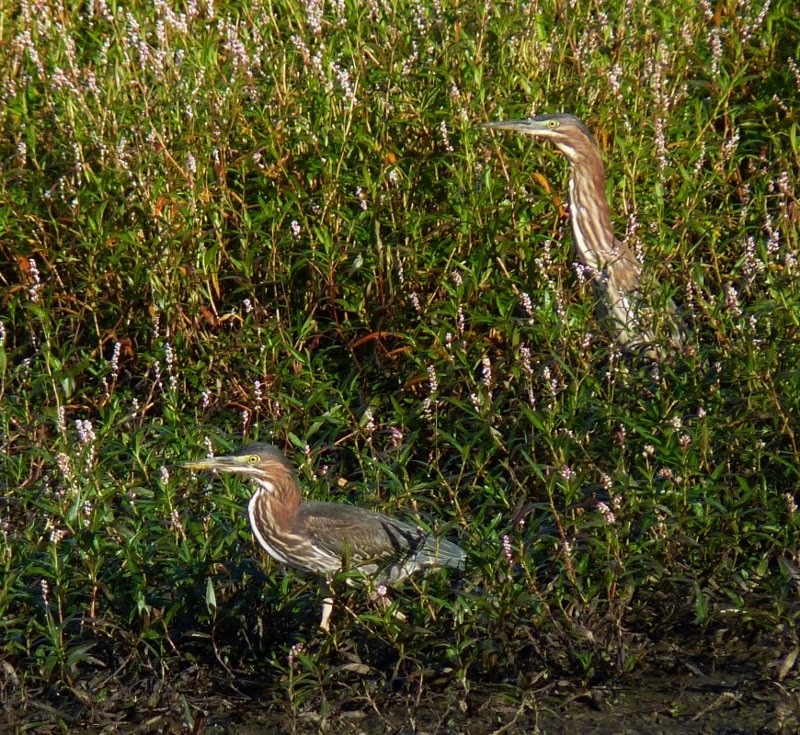 After searching the area more carefully I found that there were a total of 4 Green Herons hiding in the grass. Wangunk Meadows is not a pristine area. It has muddy dirt roads with deep ruts,mangled trees, and overgrown weeds making viewing difficult in some areas but I always seem to find some interesting birds there. 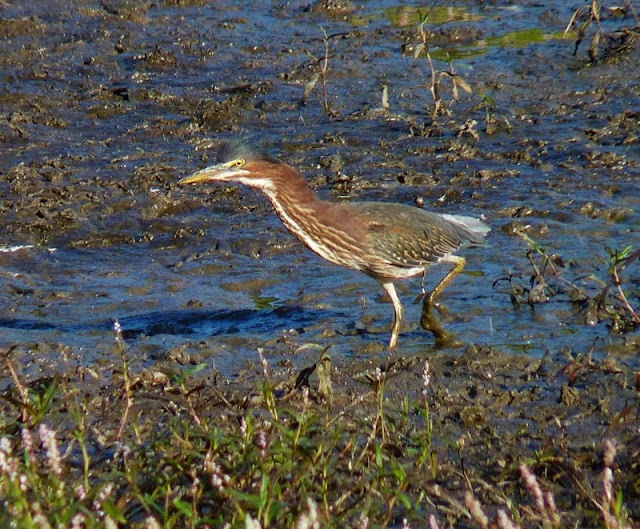 Today it was the Green Herons, an Osprey, a Solitary Sandpiper, Savannah Sparrows, Eastern Bluebirds, and a Lincoln's Sparrow that caught my attention. Birding at Wangunk Meadows reminds me of my childhood days when I used to dig under couch cushions trying to find loose change. I always managed to dig out a few quarters if I searched hard enough. Sometimes you have to dig deep to find birds at these meadows because there is so much cover but once in a while you get lucky. On October 20, 2011 I was at the fairgrounds early in the morning by myself at the same puddle pond where the Green Herons (above) were. 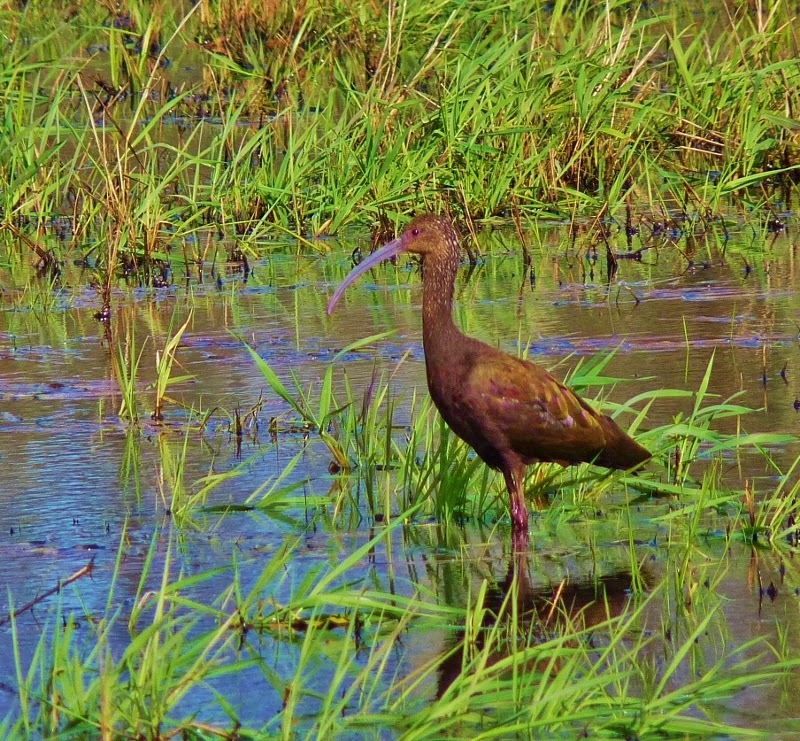 I was excited enough to find an Ibis but later that day it was determined that it was a rare sighting of White-faced Ibis. Once in a while you manage to dig a silver dollar out of the couch cushions. I've enjoyed visiting some of Connecticut's Fall Hawkwatches over the past few years. 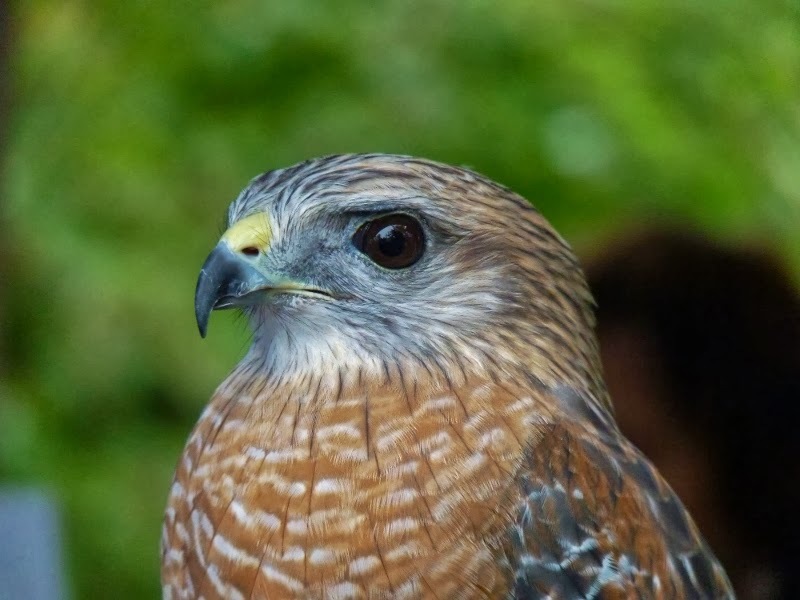 You can learn a lot from spending a day with experienced hawk watchers . Most of the hawk watch sites are about an hour or more away from where I live. There are only a few opportunities over during a 2 week period in mid-September to catch the peak of the Broad-winged Hawk migration so trying out an unproven place is a gamble. If I strike out I might miss the opportunity to witness this yearly spectacle. 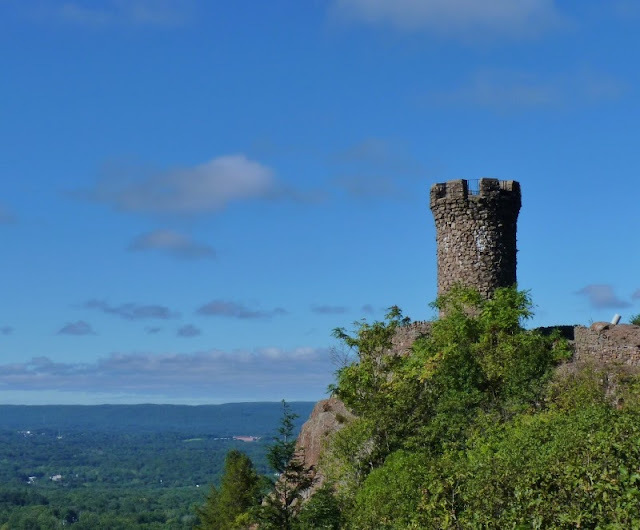 I've asked if there were any places to try that were closer to where I live and one of the suggestions was Castle Craig in Meriden so I parked at the locked gate and climbed up the trail to the top of the tower. I searched from the top for 2 hours and my best sighting was a line of 12 Broad-wings passing by. I also saw a Bald Eagle, a Red-shouldered Hawk, a Merlin?, a few sharpies, and the usual assortment of Common Ravens and Turkey Vultures. I was a bit disappointed. Conditions seemed perfect with Northwest Winds, moderate cloud cover, and a view in every direction but for some reason I didn't see many hawks. I did meet dozens of hikers and some of them had me take family photos their cell phones. Others were curious about what I was looking for. I came home at about 1:30 Pm and decided to head down the road to a nearby field along the Connecticut River. I've seen a handful of broadies pass through there in past years but never gave it a serious try under the right conditions. I set up a chair and started searching towards the north. 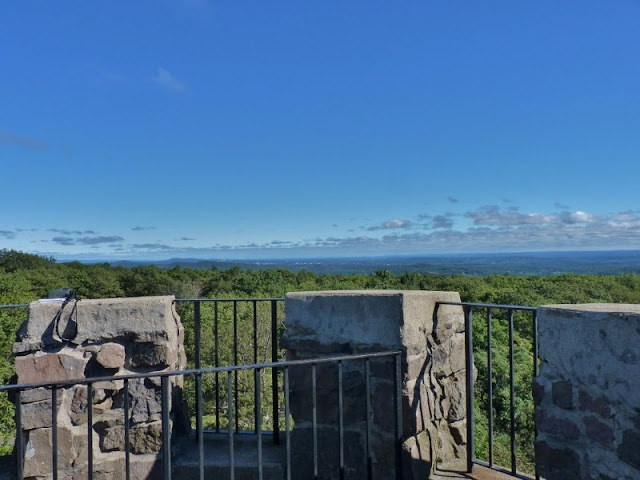 I've been told that if you draw a straight line through a Connecticut map from the southwest corner of the state to the northeast corner you will find that most migrating hawks stay north of that line if you are doing inland hawk-watching. Portland is just about on the border of that line so I figured my odds of seeing large numbers of Broad-wings was low. I realized that doing a hawkwatch by yourself can be a slow activity and the last time I checked there was only one of me. 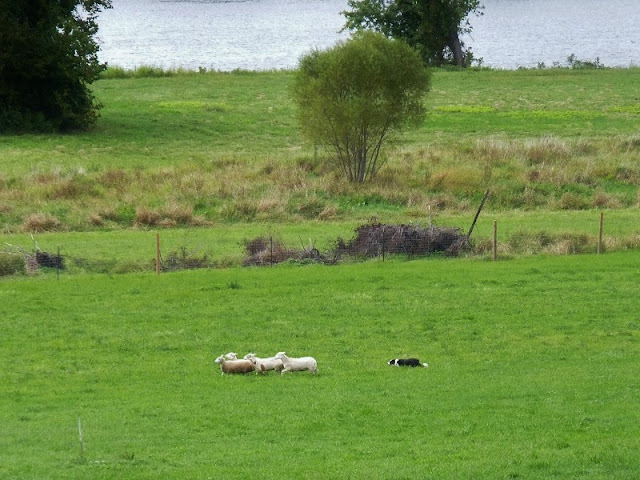 To pass time, I put the Red Sox/Yankees game on the radio and watched a dog was being trained to round up sheep in the field below. It seemed that he was more interested in sneaking up and spying on them than actually getting close enough to make them turn around. 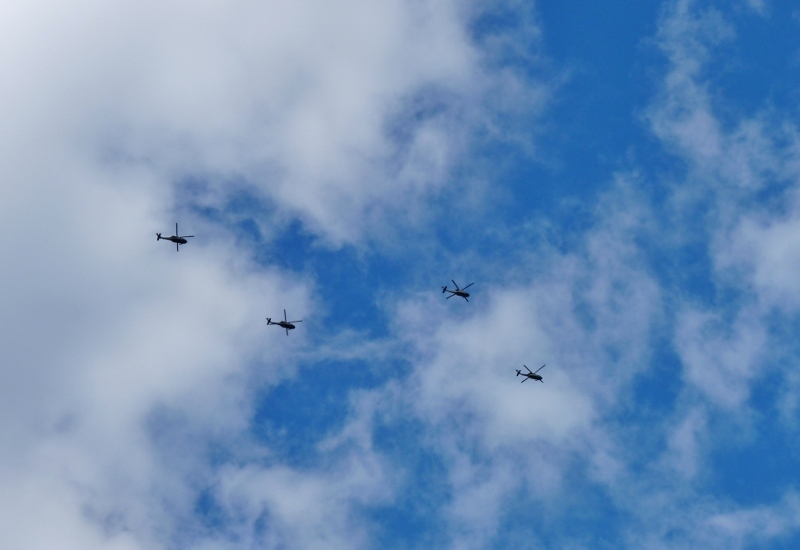 My attention was broken when 4 helicopters passed over me. I started to follow them into a dark patch of clouds and then BAAAM-Jackpot! 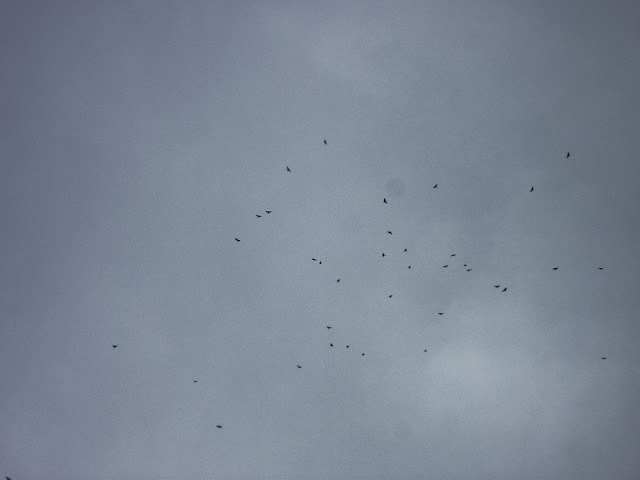 I counted 67 Broad-winged Hawks forming a kettle (you can't see all of them in the photo). That was at 2pm. At 3:30 Pm I saw a few more pass overhead. Hawk watchers will tell you if you see a few then keep watching because there may be more right behind them. By 3:40 Pm I had counted another 100 moving through in a line. In between times there were 9 more stragglers. It was Nothing like the 100's or thousands you can see a prime hawk-watching site but the fact that it was right down the road from me made it that much more rewarding. I wonder how many I would have seen if I spent the entire day at this one spot? Now I have the option of experiencing the Fall Hawk migration close to home. 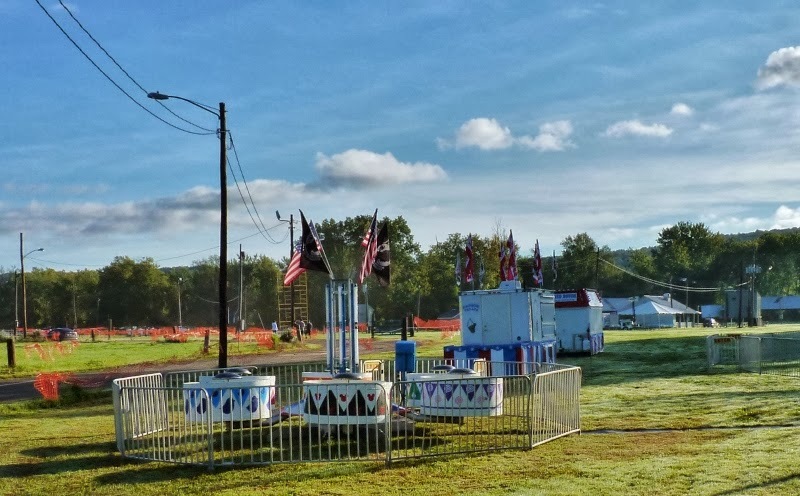 I just have to pick a day when conditions are favorable. Some times it pays take a chance. 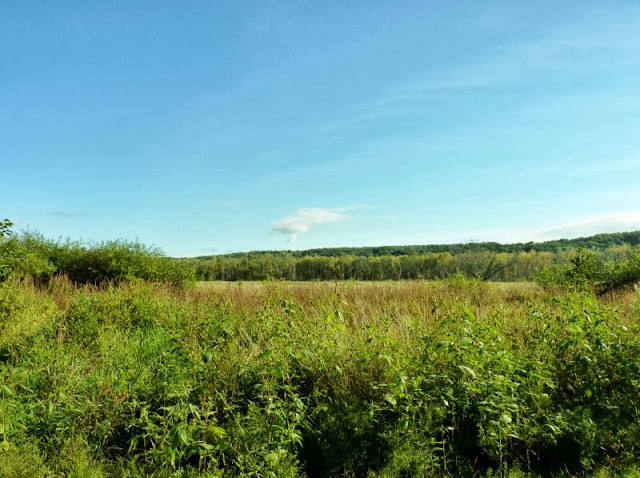 I'm still a newbie at this but a couple of good blog articles to check out on this subject can be found here at: Stokes Birding Blog and at Under Clear Skies . Also see : HawkCount.